Dynamic Remarketing to Your Customers Online > 111 Web Studio - by ICG Link, Inc.
Do you sell products or services on your website? Then this is for you. Have you ever been looking around online to purchase something, say a new pair of running shoes? You have checked several sites, but are just not sure... and then you realize it is time for your favorite TV show so you leave. 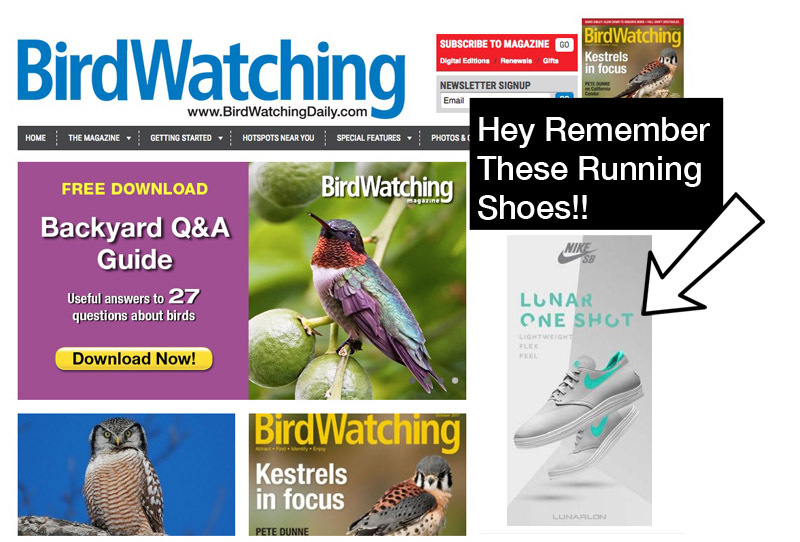 The next day as you are reading Bird Watching Daily on your laptop you see an ad out the corner of your eye for those running shoes from one of the websites you were on the day before. You are inspired to start that jogging routine, click the ad, complete the check out and BUY THOSE SHOES. That is how dynamic remarketing works. You can capture moments of your customers' journey as they move around your website, whether on service pages or specific products. You can then, automatically, advertise to them on other websites or social media channels with a personalized ad based on their activity. This can be done on mobile or desktop and cross platforms. The statistics surrounding the efficacy of Remarketing varies according to industry, but the rate of conversion for retargeted users is as high as 70%. Cart abandonment rates are still in the 45%-65% as people continue to research and explore all options online before they commit to purchase. If they do not make their decision in that moment, you have a big opportunity to give them another nudge in your direction. You can do this on platforms like Facebook, Google search and the Google Display Network, which consists of millions of websites that they choose based on your customers' preferences. Sometimes you don’t have to change your message to make a conversion, you just have to reiterate it and be there at the right time. If you are interested in exploring how Remarketing could work for your business, give us a call at 877.397.7605 or Click Here to Contact Us.